This gorgeous condo is located in Northwest Albuquerque off Irving and Golf Course in the Paradise Hills area near shopping outlets such as Cottonwood Mall and grocers. There is a single car garage with entry into the home. Once inside the home there is a staircase that leads to the main rooms of the home. The dining room is readily available connected to the living room and kitchen. The kitchen of the home offers built in shelving for decor or storage, a separate closet pantry, and all major appliances including a refrigerator, a built in microwave, a dishwasher, and a stove. There is a spacious living room available with access to the private balcony, with mountain views, via glass sliding doors. From the living room there is a hallway that connects all the rooms together. First there is a full guest bathroom with washer and dryer units included, then there are the guest bedroom and the master bedroom. The Master Bedroom has a full master bath and a ceiling fan. Disclosure: There is a non-refundable, $40 application fee per adult to apply for one of our properties. Anyone aged 18 or older who will be residing at the property must apply. We will (1) check your credit report; (2) verify past landlord references; (3) verify sufficient personal income; and (4) perform a criminal background screening. Insufficient income, poor credit, outstanding liens or judgments, history of evictions, poor rental history and/or a criminal record will all be grounds for denial. If your application is approved, there isa $55 lease processing fee charged on all new leases. No pets of any kind (with the exception of assistance animals with proper documentation) will be permitted without written permission of Tyson Properties Inc. All pets are upon owner approval, and if approved, pet fees can be up to $500 per pet upfront and $50/month per pet. up to $500 per pet upfront and $50/month per pet. 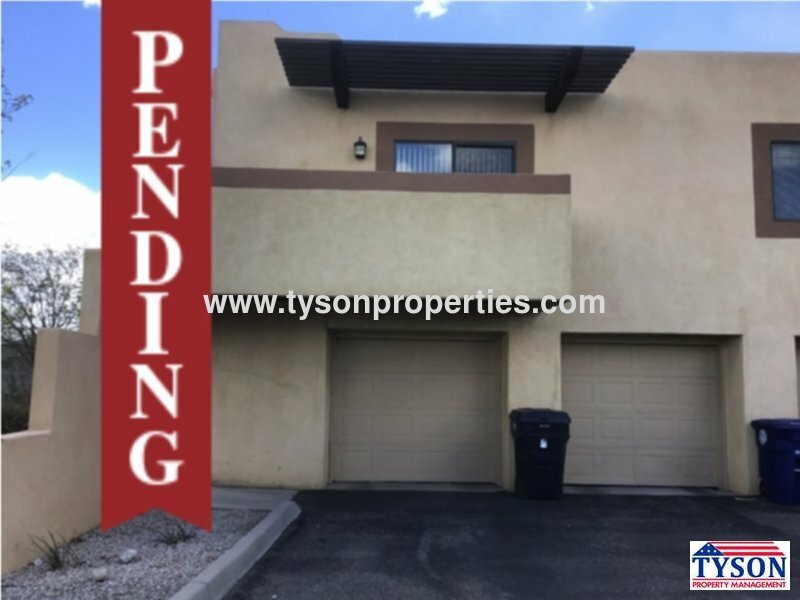 Tyson Properties is a full service Property Management company with rental homes in Albuquerque and Rio Rancho. Please keep in mind that we rent our homes fairly quickly. The homes that you see now on the web may not be available by the time you come to our office. We work on a first come, first serve basis. The first person to turn in an application, the $40 application fee, and 1/2 of the security deposit will be the first person to be considered for the home pending a background, employment and credit check. When you come into our office and the home you had originally picked is already rented, we will be glad to help you find another home that will adequately fit your needs. We look forward to meeting you and helping you find the perfect home! All of our properties are Non-Smoking Properties. No smoking will be allowed inside of or on any part of the premises at any time or by any Tenant and/or guest of the Tenant. PETS: No pets of any kind (with the exception of assistance animals with proper documentation) will be permitted without written permission of Tyson Properties Inc. All pets are upon owner approval, and if approved, there is a $100 non-refundable pet fee per pet and an additional $25 per month pet rent per pet. The following pets will NOT be accepted under any circumstances: Dobermans, Pit Bulls, Chowchows, Akitas, Rottweilers, Siberian Huskies, Malamutes, Presa Canarios, Wolf-hybrids, German Shepherds, American Stafforshire Terriers, Mastiffs, St Bernards, Great Danes, Karelian Bear Dogs, Dingos or any dog(s) cross bred with the aforementioned dogs. Additional restrictions include reptiles, rodents, insects, exotic or poisonous animals or other animals as restricted by city ordinances. Section 8 is a voluntary program and we are not participating in Section 8 or other housing voucher programs at this time. ​Disclosure: There is a non-refundable, $40 application fee per adult to apply for one of our properties. Anyone aged 18 or older who will be residing at the property must apply. We will (1) check your credit report; (2) verify past landlord references; (3) verify sufficient personal income; and (4) perform a criminal background screening. Insufficient income, poor credit, outstanding liens or judgments, history of evictions, poor rental history and/or a criminal record will all be grounds for denial. If your application is approved, there is a $55 lease processing fee charged on all new leases.